The street corner prophets often act as if they’re deeply concerned about the fate of souls they disagree with, but you can tell that they relish the prospect of eternal torment for their online enemies. “We change no one’s mind by attacking,” said Charles Camosy, an ethics professor at Fordham University in New York City. There isn’t any notion of “embodied trust” with the next online character: The provoker. The provoker doesn’t even pretend to care about the final destination for someone’s soul. They come out punching, and they love to say things that they probably wouldn’t say to someone in person. No one will listen to you if they don’t like you, said Joe Carter, an evangelical blogger and author of “How to Argue like Jesus,” a book that explores how Jesus verbally tangled with his enemies and persuaded his friends. Carter said Jesus was such an excellent communicator because he told stories that provoked emotions, took surprising twists and forced people to draw their own conclusions. But he also connected with people because of a simple reason: he cared about them. One of my best friends was an atheist. Whenever we ran into one other, we’d launch into these long, philosophical discussions about religion. I loved it. Like many atheists I subsequently met, I discovered that he knew more about the Bible than most people who claimed to be religious. It’s too bad that many of the exchanges between atheists and people of faith in our comments section don’t follow the same script. In fact, they have some of the nastiest religious arguments I’ve witnessed online. I get the source of frustration for some atheists. They have longed been caricatured by people of faith as moral degenerates who don’t care about morality. Some of them, in turn, have caricatured people of faith as weak-minded hypocrites who believe in fairy tales. Get beyond the stereotypes and actually spend time with a person of faith. And if you’re a person of faith, do the same with an atheist. You might be surprised. That’s what happened when Camosy, the Fordham University ethics professor, embarked on a speaking tour with the renowned atheist and philosopher, Peter Singer, who is seen by many as the founder of the animal rights movement. Camosy said the speaking tour forced him to read and pay attention to Singer’s arguments. He discovered that they share concerns over global poverty. He saw Singer as a person of good will. “That created the space for us to have an honest, open and fruitful exchange with one another rather than exchanging barbs,” Camosy said. It also created the space for personal transformation. I have a friend who is smart – scary smart. He’s a genial, funny guy who happens to be a theology professor. I try to hang with him when we talk religion, but there’s always a point in the conversation when he loses me. I compare that moment to watching the starship Enterprise go into warp drive. He just goes into hyperspace and my brain just isn’t big enough to follow. Some of them are self-appointed biblical experts. They talk as if they have God’s cell phone number: God has revealed great mysteries to them. They know the divine plan. In a recent article I wrote about contemporary Christians feeling as if they were persecuted, a reader identified as “Tom Skylark” let me know what all this persecution was really about. “Christians will face continued persecution then 1 Thessalonians 4:16-17 will happen right before the 7 year tribulation when Israel burns Russia’s weapons for 7 years. (Ezekiel 39:9). Those who are not taken in the rapture will have the opportunity to receive Christ during the 7 year tribulation but will be beheaded for their testimony. (Revelation 20:4). How far is Russia towards its prophetic position which means the rapture (! Thessalonians 4:16-17) is even closer? Actually, I did not know that, and I’m still not sure what it means. Sometimes the scholar is someone who believes all religion is hopelessly derivative: it’s all based on something that came before. Like I said, hyperspace. I just can’t go where “Seyedibar” has gone before. I love the scholar’s passion for religion, but some of them lose me when they try to deploy all their knowledge of history and religion in any effort to change someone else’ beliefs. Gordon Newby, a professor of Middle Eastern and South Asian Studies at Emory University, said most people change religious beliefs “not because of one argument” but only after long conversations and intimate exposure to another faith. There are some readers who give me hope when I go to the comment section. They are the “peacemakers,” and they surely bless me with their attitudes. Peacemakers try to keep arguments from getting personal. They are the online referees. They turn the other cheek. An exchange between someone called “Bootyfunk” and “KatieRose” shows a peacemaker in action. Bootyfunk says people don’t have to respect all ideas, and tells Katie Rose she shouldn't tell people not to debate religion on a blog about religion. If only the rest of the comment section had more peacemakers. I actually e-mailed readers like “Bootyfunk” and “KatieRose” to get their perspective, but all I got was silence. Not one commenter wanted to talk on the record for this story. Only one person – an atheist – responded to my invitations to chat, and he didn’t want his name used. But I have a feeling I’ll hear again from these holy trollers when I scan the comment section of Belief Blog. So will you, even if you don’t read that much about religion. These holy trollers show up in our lives and our workplaces. Many of them will sit next to us at the dinner table when families and friends get together for the upcoming holidays. When the conversation turns to religion, you may meet your holy troller, and you will have to make a choice. Do I make the peace, or do I go the war? What kind of holy troller will you be? I found this post absolutely spot-on. These reasons posted are exactly why I avoid religious discussion online at all cost. I know what I believe and why I believe it – however, I don't believe it is ethical to downplay or put others belief's down. You can disagree without disrespecting, as everyone is free to have their own personal beliefs and original thoughts. There is nothing wrong with debate, questions, and healthy banter. When you get into name calling, wishing eternal torture or harm on an individual, you have crossed a line. A book I am reading for a college class, “Ethics in Human Communication” states, “Communicators whose aim is persuasion usually seek to generate between themselves and their audience an end-state variously described as consensus, agreement or identification. But on occasion some communicators see promotion of conflict, unrest, and tension as desirable for a healthy and growing society” (p. 77) I agree that some conflict is healthy to a certain extent; however some individuals take it above and beyond what is necessary to maintain effectiveness. 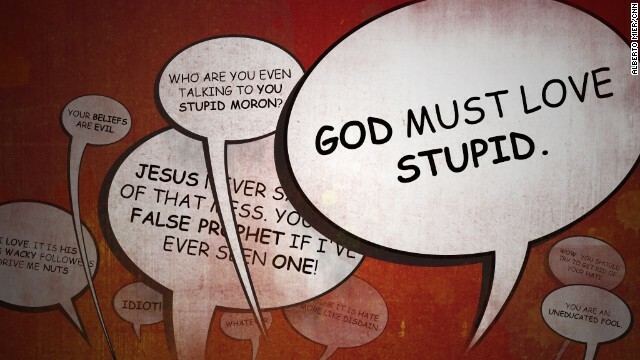 There is nothing effective about demeaning others, especially if your claim is religion. If you are trying to persuade others to follow your belief, damning them to hell is certainly not going to do it, calling them names or using vulgar language is not going to do it, and acting like you are better than them is not going to do it. This post walks that fine line of showing why those unhealthy tactics don’t work and why, and what healthy alternatives may be. It also comes from an unbiased standpoint and applies to whatever religion you claim or don’t claim to have. Thanks for the great post and informative read! Johannsesn, R. L., Valde, K. S., & Whedbee, K. E. (2008). Ethics In Human Communication (6th ed.). Long Grove, IL: Waveland Press, Inc.
That's the reason why I didn't debate about religion. "I get the source of frustration for some atheists..."
do u get the source of criminal charges for ur boy, sam stone? Just Who the in Hot hades do you think you are to be. Roasting in the faraday ovens of toasterdom like some fat oinker drippins fried up in a hotplate set on extra souped up twarp drive on a micro managed ereptile diaL?! Hell isn't a place, it's an event that's part of a series of events that begins with Jesus Christ coming back to earth the second time. This isn't a guess, it's a fact as gleaned from the text of the Holy Bible. I'm a deacon and Bible Study leader for the Beaverton Seventh Day Adventist Church. this is my completely original theory about why all religion is wrong and if you look closely and know a thing or two about physics you will see i solved the "blackhole information paradox" often argued by steven hawking. its all one solvable equation if you can distance yourself from faith. you cant learn about god in church anymore go take a physics class and a few philosophy classes to find out what god is. though you will only see this common sense version of god if you google bentgenius. the real beginning back when everything was one thing, everything was stacked so neatly into one gigantic, tightly packed blackhole. one giant super black ball of perfectly stacked atoms and molecules with all of the dimensions tightly bound together by the mass of what it was. At first though everything was fine For the Blackhole. just being was enough. It would just sit there proudly in silence. or at least something to talk to. yet alone can never show what the blackhole was missing. One time the heaviness of it all started to weigh down on the blackhole. there would never be anything else. Heavy is what blackhole became, with a ripple everything in every way that was possible became. Where once stood an all-encompassing calmness there was a ripple. as if as a last cry space was the first to go. before the ripple could even settle it was almost as if blackhole disappeared for a second . taking his place was a bright bright molten mass of chaos. Anything ,in any way possible was formed in the wake of the inter dimensional blast. all set asunder in everything crashing and grinding next to and also through each other . every shred of every single last line and ring. bringing back the information ,ultimately back to the black hole. and there in the end when the very last black hole swallows the very single last spec of dust in the universe. when the mega black hole, so perfect in his form, the ever so flat singulairity shimmering in the ultra dark its energy will have countless languages millions upon millions of consciousnesses. he will have the big picture everything he seen and liked all of the way that could be. all of the things he should keep all of the things that should never be again. the black hole will implode and do it all again .it is such a wonder that through it all, us consciousnesses , searching for us, life . in every mixture and variant possible only the last random down through every last random thing he could think. the black hole can save so it is not alone . i hope for certain he brings back all of the life that ever has lived. everything everywhere that everwas never to die again. Another tip that Blake should have mentioned. If you want people to take your seriously use proper English and grammar. This is not twitter or a text and you can spell out entire words. If you can't write and can't even capitalize a sentence or turn off your CAPS LOCK it is hard to even read if what you wrote is worthwile. Also, making death threats against people for simply disagreeing with you is foolish, and could come back against you legally. There are just too many keboard coyboys out there. tshorey2013 wrote, "Another tip that Blake should have mentioned. If you want people to take your seriously use proper English and grammar." Maybe you would be taken more seriously if you followed your own advice. Try "If you want people to take you seriously" instead of "If you want people to take your seriously."